We propose a rigorous definition for the termtemporal encoding as it is applied to schemes for the representation of information withinpatterns of neuronal action potentials, and distinguish temporal encoding schemes from those based on window-averagedmean rate encoding. 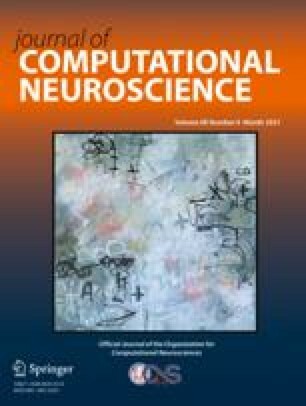 The definition relies on the identification of anencoding time window, defined as the duration of a neuron's spike train assumed to correspond to a single symbol in the neural code. The duration of the encoding time window is dictated by the time scale of the information being encoded. We distinguish between the concepts of theencoding time window and theintegration time window, the latter of which is defined as the duration of a stimulus signal that affects the response of the neuron. We note that the duration of the encoding and integration windows might be significantly different. We also present objective, experimentally assessable criteria for identifying neurons and neuronal ensembles that utilize temporal encoding to any significant extent. The definitions and criteria are made rigorous within the contexts of several commonly used analytical approaches, including thestimulus reconstruction analysis technique. Several examples are presented to illustrate the distinctions between and relative capabilities of rate encoding and temporal encoding schemes. We also distinguish our usage oftemporal encoding from the termtemporal coding, which is commonly used in reference to the representation of information about thetiming of events by rate encoding schemes.